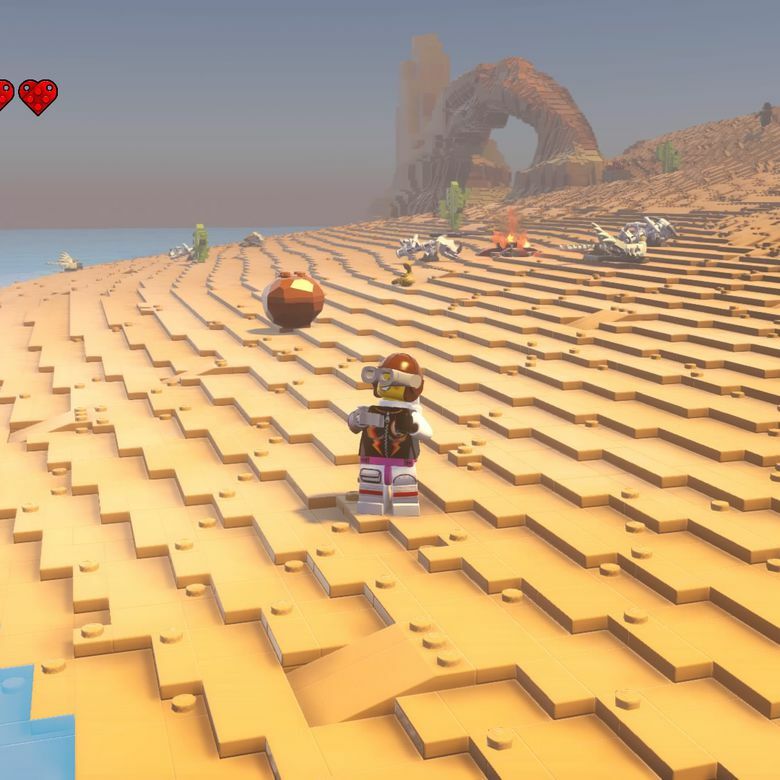 LEGO Worlds is a sandbox construction game with unique worlds and a variety of tools to build almost anything, but comes with repetitive and sometimes frustrating gameplay. LEGO Worlds is a game focused on combining the fun creativity of the LEGO brand with a humorous narrative in a sandbox construction game. Using a variety of tools, the game has a lot to offer but focuses more on exploration than plot. We picked the PlayStation 4 version and spent hours exploring its controls, plot, graphics, and kid-friendliness. Just like most PS4 games that come by disk, LEGO Worlds was simple to install. Insert the disk and the game will prompt you to do an installation process before you can play the game. Afterwards, you can begin playing immediately, but be aware that an internet connection is necessary if you want to go beyond the adventure version of the game and access the worlds online where you can adventure with other online players. You’re an astronaut when your spaceship starts falling and find yourself on a new world. Your spaceship is broken and you’ll need to find parts (golden LEGO bricks) to repair it. This game isn’t really focused on plot much past this. You explore the world you’ve fallen upon and you’ll find people in need of your help. As you go you’ll discover new tools to help you on your way. These include: Discovery Tool, where you learn the models around you and store them in a library you can access later to recreate everything you’ve discovered, whether it’s something small like a frog or something big like an ice castle; Build Tool, where you pick any LEGO brick and place it precisely to build a larger structure; Copy Tool, where you select an area of bricks to copy and save the model to build again later; Paint Tool, where splatter any color on the bricks around you, or even turn them to slime, water, or lava; and the Landscape Tool, where you raise mountains or lower hills, remove square sections of the ground or fill it). The game has a great sense of humor. A charismatic narrator tells you where to go, what each of your tools does, and even cracks the occasional joke. With these items, you’ll set out across different worlds, and LEGO minifigures will request you do different jobs for them, from painting their house a more pleasing color, to building their new home. Basically, it’s up to you what the plot is. You pick which worlds you want to visit, who you want to help or ignore, how you want to solve each person’s problem, and how it is you want to earn your gold bricks. While there isn’t much of a plot, it is worth noting the game has a great sense of humor. A charismatic narrator tells you where to go, what each of your tools does, and even cracks the occasional joke. Like a weird ghost that follows you around, he’ll be there if you need a little direction. There is also humor in the characters you meet, like the old fisherman who will complain about needing somewhere to fish because of a shark, or the bandit who got stuck in a vault and needs you to set him free. You’ll get to choose which tasks you want to do and which worlds you want to visit, making the plot your own. LEGO Worlds is a sandbox construction game focused on adventure and exploration. Once you’ve unlocked all the game’s tools, you will have almost limitless possibilities in how you can build. You can discover and learn how to construct the items you see around you. You can copy buildings and save the models for later. You can even use the Build tool to use individual bricks to create a unique creation―the potential of what you can do is only limited by your own imagination. Choose water bricks to build rivers. Paint lava across a mountain and watch it burn. Befriend animals with different food and hop on them for a ride. Discover different vehicles from a helicopter, to an underwater submarine to help you explore the different worlds you visit. Befriend pirates and witches, build mountains or destroy homes―the possibilities really are limitless. The game does have its flaws. On a PlayStation controller, it isn’t easy to maneuver bricks, and building something from scratch can take a lot of time and cause a lot of frustration. However, the game does have its flaws. On a PlayStation controller, it isn’t easy to maneuver bricks, and building something from scratch can take a lot of time and cause a lot of frustration. We struggled with the controls, and often had to constantly adjust and open the menu again to make sure things were selected properly. LEGO Worlds is also available on PC, making us wonder if the controls wouldn’t be easier to use there. The gameplay too, while allowing you to choose your own path, does become repetitive. Ultimately, everything starts to swim together as all the tasks involving painting, building, or destroying. On top of the repetition and clunkiness, we had other bigger issues. Our game crashed randomly more than once while we were in the middle of exploring, and twice the sound bugged out where we could only hear specific sound effects. It seems in its endeavor to do everything (and it truly does a lot), LEGO Worlds failed to make sure everything was in perfect working order. Like the popular LEGO movies and TV shows, LEGO Worlds is built around the idea of everything within the world being created from LEGO pieces. Flames are made from tiny flame LEGO bricks, creatures move around and have LEGO bottoms just like the real-life pieces. Any LEGO fan that enjoys building sets will love the attention to detail in this game. Even the LEGO minifigures you encounter are unlockable, and soon you can pick and choose your figure’s cosmetics, from the hair, down to the color of your hands. Be aware that depending on which minifigure face you choose, your character can do different things. For instance, if you choose the skeleton face, you’ll be able to scream scarily at people. If you pick the caroler from the holiday world, you’ll be able to sing and make the minifigures around you dance. The worlds themselves are creatively designed and always different. In one, we got to fly around a swap in a helicopter and even stopped to surf on the back of an alligator. In another, we cut our way through a giant ice cream cone and helped save a witch’s pig from a giant sponge cake. The game is colorful and fun, which invites you to explore and discover new items, new minifigures, and new worlds. While we did enjoy ourselves moment to moment and laughed occasionally at the absurdity and chaos we could create, we felt the game was best suited to children. The humorous narrative is geared more toward children, and the way we felt about the game’s controls being clunky might not be an issue for a kid. There is also a co-op feature in the game where a friend can jump in and help you build and explore. Overall, the game was fun, and we can easily see how a kid, especially kids who love LEGO, would get lost in LEGO Worlds for hours on end, trying to discover every item, open every chest, and build every set. We would highly recommend this game for children who love to build and explore and want a casual yet fun gameplay experience. LEGO Worlds can be found on any of the available platforms for $20-$30 MSRP. This isn’t an unreasonable price for the amount of gameplay available. If you want to wait, the game does go on sale occasionally for PC. Either way, we feel $20 is a good price for what the game has to offer. If you’re looking for similar gameplay with regards to sandbox construction, Minecraft and Roblox are similar titles worth looking into. Minecraft has a huge fandom and people love what the game has to offer. If you’re looking for more games that embrace the LEGO world, there are a variety of fandoms, from Batman, Star Wars, Harry Potter, The Hobbit, and Marvel. These games will share the fighting, adventure, and humor of LEGO Worlds, but get away from the building and construction. Check out our guide to the best PlayStation 4 games for kids you can buy today. Between the humorous narrative, the never-ending building possibilities, and the new world exploration, this game makes up for the clunky controls and the occasional crash. Any child, especially one who loves to build with LEGO bricks, will find hours and hours of fun to be had in this game. Product Dimensions 0.5 x 5.3 x 6.7 in.